Hastings Priory cricketer Harry Finch scored a splendid century for Sussex against Pakistan yesterday (Saturday). Opening the batting for the first time in first-class cricket, Finch made 103 in Sussex’s first innings of the three-day match at the 1st Central County Ground, Hove. 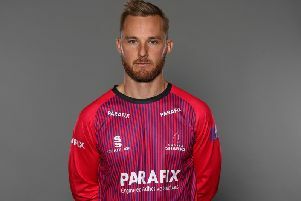 Finch, whose previous first-class hundred had come against Leeds/Bradford MCCU at the start of this season, hit 16 fours and three sixes in a 140-ball knock, and forged an opening stand of 212 with Luke Wells. He gave one chance on 64 when he drove low to short cover off Zulfiqar Babar, but was particularly impressive on the front foot. Sussex posted 291-5 declared in reply to Pakistan’s 363-5 declared and the tourists were 71-1 in their second innings at the end of day two. The 21-year-old Finch came up through the youth ranks at Priory and Sussex, and achieved international recognition with England under-19s. The right-handed batsman has yet to feature for Priory this season, but did make seven appearances during their promotion-winning campaign of last summer, scoring 410 runs with a best of 126 not out.